In 2013, I joined the Seattle to Lake Okanagan trip by way of the Lake Chelan AVA and went on the OK Falls hike where I discovered Painted Rock which I wrote about here also. When the announcement that Wine Blogging Wednesday #80 was Dry Rose, I didn’t have to think too hard about which wine I wanted to write about: “My Derby Wife” rose was one of the wines that I not only tasted on the Lake Chelan trip, but one I bought and had shipped back home to California. And why did I have to buy this wine and write about it you ask? Well, for one, the grapes are grown by an artist named Gwen! Yes, my namesake is up in Lake Chelan in a beautiful house with views of the Lake and about one mile above the Blending Room wine tasting facility in Mason, WA. She has a painting studio inside, but on the day we visited, she was painting in her sunny garage where a number of her paintings were on display. 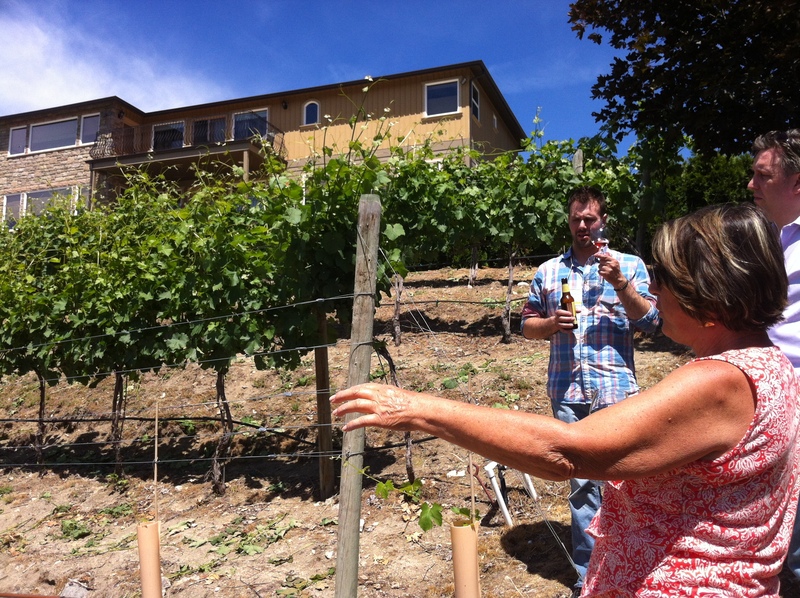 When we arrived by limo , we were greeted and walked down the hill into the six acres of syrah grapes and were handed glasses of the rose made from the grapes from these vines. Two, gotta love the label art by Krysztof Nemeth which features a drawing a a real roller girl! 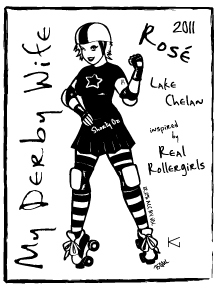 Three, love the name “My Derby Wife”! 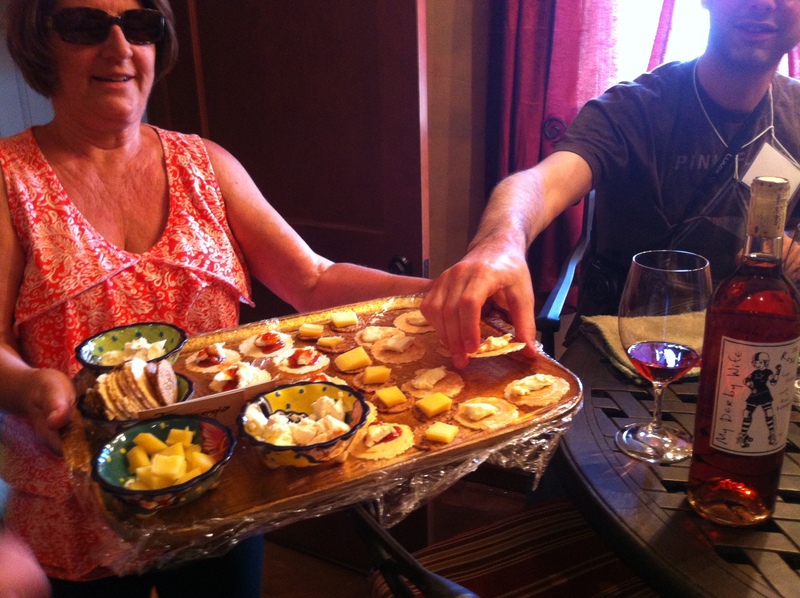 Four, it’s a great wine–it really does pack a punch! In this case, a spicy watermelon punch! Some dry roses are very subtle and mile but this one is not. It’s a lovely coral/pink/salmon color, with a lively fruit, citrus, mint, and cinnamon on the nose. Not sweet but sassy. On the palate it is lively with lots of bright acid, and a clean, lengthy finish. I paired it with a simple summer dinner of grilled chicken sausage, rice, and fresh summer vegetables. WineGirl Wines describe themselves as a nano-winery: for example, Only 20 cases of this rose were produced, and according to the website, it’s all sold out, so you’ll have to get yours next year. I also bought a “My Derby Wife” malbec which will give me a reason to revisit WineGirl Wine and tell you more about them as well as the Lake Chelan AVA.